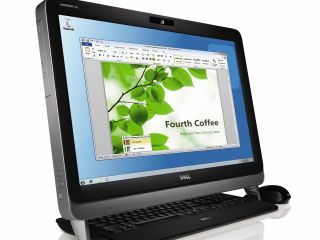 Dell has added to its Inspiron 'family' with the touchscreen all-in-one Inspiron One and Inspiron Zino HD media PC the latest to join the computer giant's desktop range. The Dell Inspiron One is billed as the 'perfect family PC', although presumably that family does not leave sticky fingerprints on the touchscreen, with the Dell Inspiron HD a 'mini powerhouse PC offering Dell's best home theatre capability. The all-in-one Inspiron One offers what Dell is terming "Space saving, stylish design with unique keyboard storage under the display and built in Wi-Fi, webcam and HDMI. The Zino HD is a media PC which offers 'awe inspiring' video and audio, should connect easily to home HD TVs and comes in a compact form factor with three optional lids. "Delivering on its promise to offer the best in next-generation entertainment, Dell has added to its award-winning Inspiron family a new Inspiron all-in-one desktop and a new Inspiron Zino HD desktop offering the best home-theatre capabilities in its class," explains Dell. "At the centre of the new line-up is the Inspiron One, with features that set it apart from other all-in-one PCs including: a full HD 23-inch LED-backlit LCD; an optional quad-core processor that zips through web surfing, movie watching, family photo album creation, video chats and more. "It has a host of audio/visual inputs that instantly transform the PC into a TV, perfect for student dorm rooms and family settings. "Rounding out the refreshed Inspiron desktop family is the Inspiron Zino HD, the next-generation version of the award-winning system that sports a powerhouse entertainment experience in a compact design. "The Inspiron Zino HD connects easily to big-screen high-definition TVs for an amazing family entertainment experience. "With an optional remote control and wireless keyboard, viewers can surf the Internet from their living room couch, watch Blu-ray DVDs or browse their music and photo libraries – all on the big screen. And its compact 8-inch-by-8-inch footprint fits unobtrusively anywhere." The Dell Inspiron Zino HD has a UK price of £329 and is available now, with a vague UK release date of 'later this year' and no confirmed price for the Inspiron One.